For those of you who know me, you probably know that my birthday has come and gone over a few weeks ago! Although I had intended to finish my 25 life lessons before my birthday, my life was a little hectic in the week leading up to it (I was at a national conference during the few days leading up to my birthday and was busy at the conference). In addition, I had a lot of difficulty finalizing those last five lessons. What did I want to say? What were the most important lessons that I learned in the first quarter of my life that I really thought were worth sharing? There’s so many things that I could say or wanted to say that it was hard to narrow it down to only five. So, I didn’t…and I tried to figure out what were the most important things to know. Of the lessons I had in mind, what were the lessons that I would want my (future) kids to know? When I do have children, what will I teach them? What are some of the first things that I will teach them? Well, there are a lot of things we can and should teach our kids, but below are some of the lessons I learned that I know I will most definitely pass onto my future offspring. Life Lesson #21: Be there. Each year, the catholic schools in my diocese have a baccalaureate mass the night before commencement. In the past few years, the diocese’s relatively new bishop presides over the mass. In one of his homilies in recent years, he talked about the importance of being there for others. He challenged the seniors and the congregation to live a life in which they would be there for others at all times. Be there for your friends and family to help them celebrate when things go well in their lives, but also be there for them when the going gets tough. Hold out a hand to a person who is need, and be willing to offer a warm embrace when all someone needs is a hug. I’d like to expound upon the part about being there others in things aren’t going so great. It’s easy to be there for others when things are going well and you can join in the celebrations. However, we must also be there for others when things aren’t so pleasant. When a friend is upset and questioning a life decision, or when they’re depressed about something going on in their life, we must also be there for them in those times of need for those are the times when they probably need us most. Anyone can be there for the good times; everyone wants to take part in a celebration. However, the real challenge is to be there in these difficult times. Growing up, my parents always stressed the importance of being there for others especially in these difficult times. I cannot tell you how many times I went to calling hours as a child before I fully comprehended the finality of death. I know that some people would disagree with children going to calling hours at a young age, but in retrospect, I think having those experiences taught me a lot. They taught me what it meant to be there for others when they needed it most. They made it a lot easier to deal with these situations as an adult. Had I not had these experiences, it would have been a lot more challenging for me to handle these challenges. I’d also like to think that when we find ourselves in difficult situations, we’d want someone to be there for us, so why shouldn’t we be there for others during these times? Life Lesson #22: DO something that scares you. This is a tough one and it’s a lesson that I’m still coming to terms with. I think the lesson here is not to let fear rule your life. It’s easy to have fears and to let these thoughts or worries impact your decisions. However, you can’t live in a bubble. If you avoided everything that scared you and made decisions based solely on things that didn’t scare you, I’d venture to say that you’d probably miss out on a whole lot. This can apply to anything – whether it’s entering a relationship rather than avoiding one for fear of getting hurt, or going on a crazy adventure rather than staying inside because you’re afraid of the number of things that can go wrong. As many of you know, I’ll be applying for graduate school in the fall. I think I’m beginning to have a better sense of what I want to study which is awesome. However, with this new found understanding has come a realization that many of the schools that have what I want are all around the country from out west to the deep south. The thought of spending 4 years there and being away from my family and friends terrifies me. It’s such a scary thought and it makes me really nervous to think about the possibility of moving to one of these places. However, I know that applying to these places is the best thing I can do for my future. I’d like to think that if I applied and got into one of these schools that I’d have a better chance of being able to eventually make my way back to Ohio in a relatively short period of time. I guess you’d say that I’m following one of my previous life lessons in thinking about the future. Life Lesson #23: Accept that not everyone will like you. As a kid, we want everyone to like us. We want to be friends with everyone we meet (or at the very least, we want to be invited to all of our classmates’ birthday parties) and if someone tells us they feel otherwise, our feelings are immediately crushed. I’m telling you now that it’s OK. Someone may not like you and you may have no idea why. Or, it might be because you ticked them off and you were aware of that crucial moment that changed everything. Or, it could be because of the way you look at them, or the way you talk, or the way you dress, or a million other things. It truly could be anything and there’s no true way of knowing the cause. Don’t fret and don’t waste time or energy on these people (Side lesson: also realize that you can’t please everyone, so don’t worry about making everyone happy. It truly is impossible). Life Lesson #24: Be someone that you would want your kid to admire. As some point in our lives, we’ve all looked up to someone. We’ve found a role model who has led us in the right direction and have used them as a guide for how to act in certain situations. Perhaps we have multiple role models who have inspired or challenged us to be better and do better – it’s possible that this person has challenged us to do something we otherwise would have never considered. 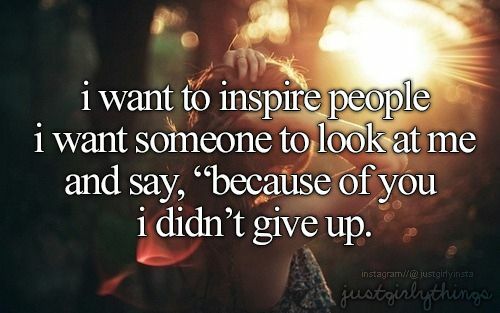 Be this type of person for someone else. Life Lesson #25: Don’t compare yourself to others. This one is challenging and it may be something that you struggle with for a long time. Don’t compare yourself with others. Someone will always be smarter, faster, prettier…and the list continues. There is always going to be someone who has an edge over you in some way, shape, or form. But it doesn’t matter. Believe that you are good at what you do and fully capable of facing any challenge that comes your way. 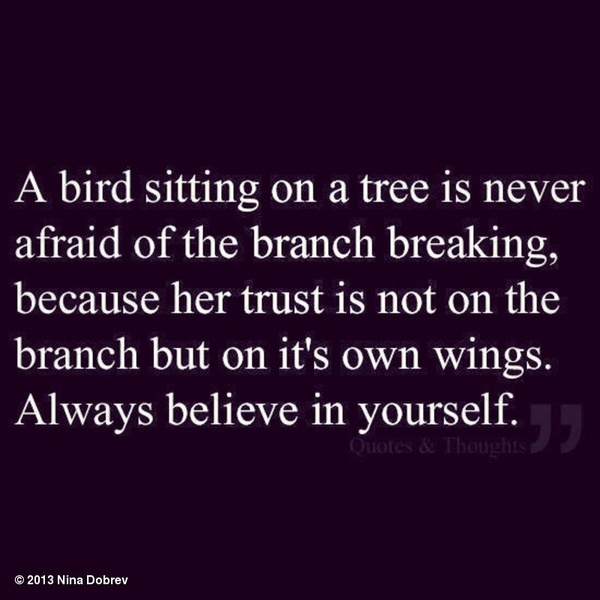 Life Lesson #26: Always, always, always believe in yourself. Ignore your negative self-talk. Rid yourself of people who put you down. And just believe.